Breakfast included. 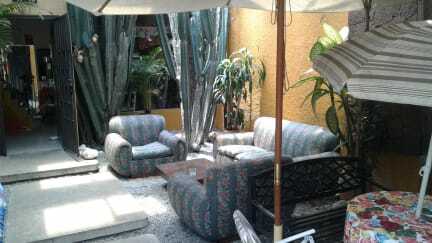 2 blocks away from 'La Floresta' metro station. We offer an alternative to the party hostel with a calmer warm and family atmosphere. Hot shower with water heated by gas. Located in a calm residential area, you will find all you need (bars, restaurants, banks and supermarkets) just a 5 minute walking distance. We are not in the Poblado but in another part of the city close to the stadium. Probably the smallest and the most basic hostel in town. The house has five private bedrooms, four with private bathroom and one without, a six beds dorm with fan and 2 shared bathrooms. Breakfast buffet with eggs, bread, jam butter, fresh fruits, cereals with milk, fresh cheese...until you are full. Taxi service at the international airport (70.000 pesos), book it with us. It was a lovely place. Comfortable bed. Awesome private and public spaces. Delightful and respectful people. Breakfast was offered and delicious. Fresh fruit juice, toast, eggs, fruit and coffee. What more could one ask for? Quiet and cozy and sometimes a beautiful cat! Very nice hostel. A very quiet and homely atmosphere. The staff is amazing. The most friendly and helpful staff I’ve ever experienced. Make you feel very welcome. The location is not in the centre but a bit north from the city. Liked a lot this hostel, location was good close to the metro. The staff was very friendly. It was very quiet and peaceful. I stayed in Yellow House for 5 nights at the beginning of February 2018. The place has a very tranquil, welcoming vibe. All the staff is incredible and we had really nice moments in the evenings practicing Spanish, salsa, making food together, etc. 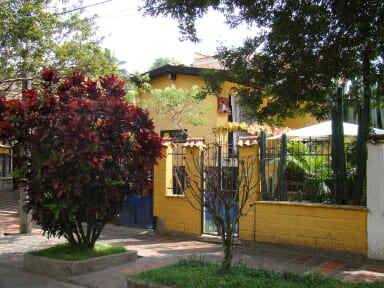 The place is a 2 min walk from the Metro station and the neighborhood is really beautiful, safe and calm. Highly recommended! We had changed hostels and this was a welcome change! The staff were very friendly and helpful, and we were very happy with how quiet it was! Perfect location, lovely clean hostel that is really peaceful. Breakfast is really poor & not as described but there are new people now running it and are still finding their feet.